Manchester United won their sixth game out of six under Ole Gunnar Solskjaer with victory over Tottenham, while Liverpool moved seven points clear at the top by beating Brighton. Chelsea consolidated their place in the top four with a win against Newcastle but Arsenal lost ground when losing at West Ham. Burnley earned a big win over relegation rivals Fulham, while there was also an important three points for strugglers Southampton against Leicester, while Cardiff and Huddersfield played out a goalless draw. Everton also climbed into the top half by beating Bournemouth and Watford won away at Crystal Palace. What a performance it was by the Manchester United goalkeeper against Tottenham. I can’t remember seeing a keeper use his feet so effectively in a top-flight game since Spurs and Arsenal legend Pat Jennings. The shot from Harry Kane was dealt with so comfortably, all because of De Gea’s ability to improvise. The save from Dele Alli’s header was even better but the stop from Toby Alderweireld, again with his feet, was just unbelievable. Did you know? David de Gea made 11 saves in this match for Manchester United – only against Arsenal in December 2017 has he made more in a Premier League match (14). This was the highest number of saves he has made in a league game while also keeping a clean sheet. James Tarkowski: What defending it was from Tarkowski to clear off the line in Burnley’s crucial win over Fulham. Talk about a match-winning moment. First of all, to see the danger before it occurs is a talent. Then to put yourself in a position to handle the threat – but not to panic when it is down to you to kick the ball off the line – is quite brilliant and it was the reason Burnley came away with all three points. Meanwhile, Fulham are fighting for their lives – but I saw enough here to suggest that if they can keep up this level of performance, their season is not over by a long chalk. Did you know? James Tarkowski has made more blocks than any other player in the Premier League this season (32). Kurt Zouma: I’ve seen this lad play for Chelsea, Stoke and now Everton. A lot of time and coaching has gone into his game and finally it looks to be paying off. Alongside Michael Keane, Zouma appeared composed in defence in a way I haven’t seen him at his two previous clubs – and looked commanding in the opposition’s penalty area. He looks as if he’s starting to grow up. Did you know? Kurt Zouma was the 139th player to score a goal for Everton in the Premier League. Only West Ham (147), Tottenham (146) and Newcastle (141) have seen more players score for them in the competition. Fabinho: This player has become a far more important addition to the Liverpool set-up than I first realised. The Brazilian enforcer looks better at centre-back than he does in midfield. At least that’s how it appeared against a Brighton side who made life difficult for the league leaders but struggled to really hurt them. When there was the slightest threat, Fabinho snuffed it out. His positioning throughout the match was quite impressive. Any more displays like that and Dejan Lovren might have to start looking for new employers. Did you know? Liverpool are unbeaten in the nine Premier League games that Fabinho has started this season (W8 D1), with the team scoring 23 goals and conceding just four in return. Paul Pogba: The midfielder has four goals and four assists since the departure of Jose Mourinho. However, it’s his overall contribution during these past weeks that has left me almost speechless. The ball he provided for Marcus Rashford to score the winning goal against Spurs was nothing short of world class. 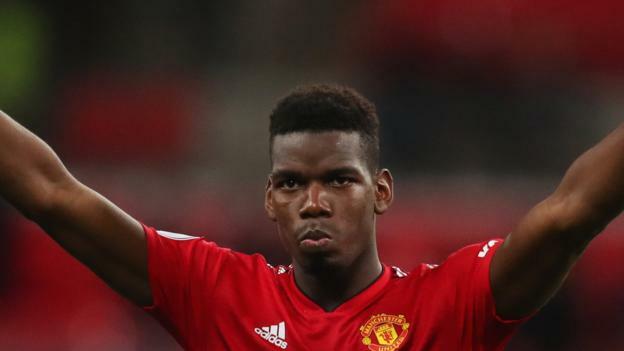 I don’t know if this new-found commitment and drive is all down to Ole Gunnar Solskjaer, but what is clear is that if Pogba can retain this sort of consistency, Manchester United will soon start winning things again – and in style. Did you know? Paul Pogba has been directly involved in 53% of Man Utd’s 15 Premier League goals since Ole Gunnar Solskjaer took charge. Declan Rice: He is 20 on Monday, and celebrated by scoring his first West Ham goal in a win against Arsenal. While he can’t make his mind up whether to play for England or the Republic of Ireland, Rice is impressing with his club. It’s clear to me that if he continues to develop at his current rate of knots, he’s a Hammers captain-in-waiting. As for Arsenal, their midfield was woefully lacking creativity – yet Unai Emery left Mesut Ozil, his most gifted footballer, out of the squad and Aaron Ramsey on the bench. Explain that to me. Did you know? Declan Rice became the 10th teenager to score a Premier League goal for West Ham, and the first since Junior Stanislas in November 2009. Ademola Lookman: When this lad’s loan spell with RB Leipzig ended, he returned to Everton a proper player. The England Under-21 international’s first-half performance against Bournemouth was the best I’ve seen him play. Lookman now possesses the strength to finish games the way he starts them – full of running. His ball for Dominic Calvert-Lewin to seal the match in the dying moments said as much. Did you know? Both of Lookman’s Premier League assists this season have been for Dominic Calvert Lewin – who on both occasions was a substitute. Willian: I have always thought that Willian is one of the most gifted players in the Premier League. I go to Stamford Bridge a lot, but don’t see enough of what I know he can do. The goal he scored against Newcastle was just a glimpse of the quality that the Brazilian possesses. We’ve seen him score goals like that on a number of occasions for Chelsea. However, I want to see the Brazilian dictate the play and sadly I haven’t seen much of that this season. Maybe the goal against Newcastle will be the catalyst. Did you know? Among all Chelsea players, only Eden Hazard (58) has created more chances than Willian (50) in the Premier League season. Andre Schurrle: What a goal it was by Andre Schurrle at Burnley. I don’t think I’m going to see a better one all season. To take the ball out of the sky with your right boot is one thing – but then to rifle the shot into the roof of the net, all in one movement, is something else entirely. An absolutely magnificent finish. With Schurrle, Aleksandar Mitrovic and Ryan Sessegnon in the side, Fulham may just have enough to stay up if they can keep their nerve. They’ve done it before, you know. Did you know? Andre Schurrle’s opener against Burnley (one minute 49 seconds) was the quickest goal by a Fulham player in the Premier League since Clint Dempsey scored against Norwich City in March 2012 (one minute 46 seconds). Marcus Rashford: Regular readers of my team of the week column will know what I think of Marcus Rashford. With a little bit of luck and a fair wind, I believe this lad can be whatever he wants to be. Like most United players, Rashford looks a very happy bunny under the new management and fits up front perfectly with United’s speedy style. It will be very interesting to see what happens to Romelu Lukaku now. Did you know? Marcus Rashford has scored in three consecutive Premier League games for the first time in his career. Mohamed Salah: I cannot believe Brighton’s Pascal Gross fell for it. We’ve all seen Mohamed Salah go down from the slightest touch in the penalty area (normally at Anfield) but there was no doubt about this one on Saturday. Salah teased and enticed Gross to such an extent the German just had to have a bite. The result was another penalty attributed to Salah’s ingenuity. The Egypt international took the spot-kick and buried it into the back of the net to extend Liverpool’s lead at the top of the table. And that’s why he’s in my team of the week. Did you know? Of the past 10 Premier League penalties taken by left-footed players, six have failed to score – the other four have all been scored by Mohamed Salah. You’ve seen my picks this week. But who would you go for? I really don’t know what the fuss is all about. The very suggestion that Leeds United should be deducted points, because their manager sent his coach to surreptitiously observe Derby County’s tactics, is bordering on madness. This sort of thing has been going on for as long as I can remember. I recall being told by a friend, who was out of his team at the time, that his captain and centre-back had a signal when about to engage in a tackle. This was the night before my team were to play them. He was quite at ease telling me what it was. I thought he was committing heresy, but was extremely grateful nonetheless because I knew it gave me the edge. It was the difference between me releasing the ball for fear of losing possession in the tackle or retaining the ball in a very dangerous position. Should he have done it? Of course not, but I was not interested in his reasons. It might have been because he wanted to leave the club or didn’t like the manager – who knows? The point is: It happens. The bigger question was: Did I have the ability to take advantage of the situation? The reason clubs have their own training ground, and private training sessions in the modern era, is to try to conceal their plans and strategies. Can you blame the opposition for trying to find out what those plans are? It would be very strange if they didn’t. As for Leeds manager Marcelo Bielsa, his only crime was being so honest and owning up to the charge. So many don’t.